I talk to my mom every few days. Since I haven’t spoken to her in a while, I’m going to use you as my pseudomom. and was using both hands to cut through the last strand. 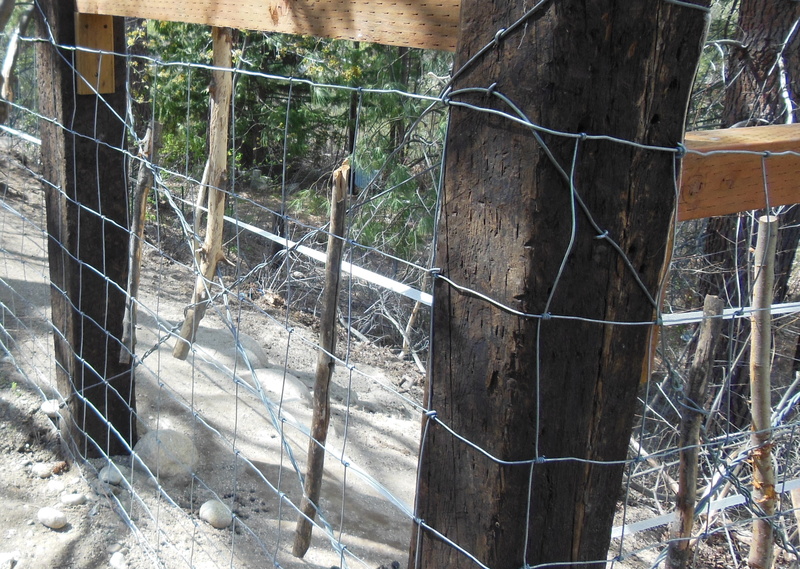 As soon as the wire was free it sprang up and smacked me in the face. At first I just thought, oh, my gosh, I’m such an idiot for not holding it down. When blood started trickling down my face I had to go up to the house to get it cleaned up. Daniel was so mad at me. He’s a very safety-conscious guy and always wears his safety glasses. Here I was with a small puncture wound just an inch from my eye. Too close! 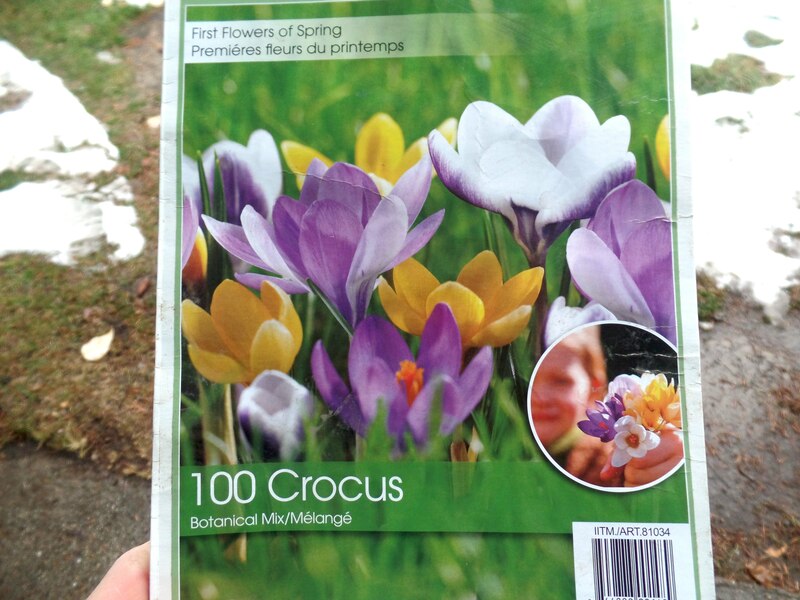 I bought some crocuses over a month ago at Costco. I love the mixed ‘species’ kind and so I bought them even though I didn’t know where I’d put them. Well, this last Friday, I was raking the yard because it had started to snow. I noticed that the ground was not frozen yet in the old strip of flowerbed alongside the house. I decided to plant them there. I wanted some dirt to raise the bed up and grade it so it sloped away from the house. Currently it was a small depression and didn’t encourage proper drainage away from our foundation. Our neighbors are building a second home on their property for her parents and so I went over there to ask if they had any loose dirt. I ended up with a truckload from a kind excavation worker. I can’t tell you how thrilled I was to be planting crocuses with my sons in a properly elevated flowerbed. It didn’t bother me at all that it was in the dark as it was snowing! 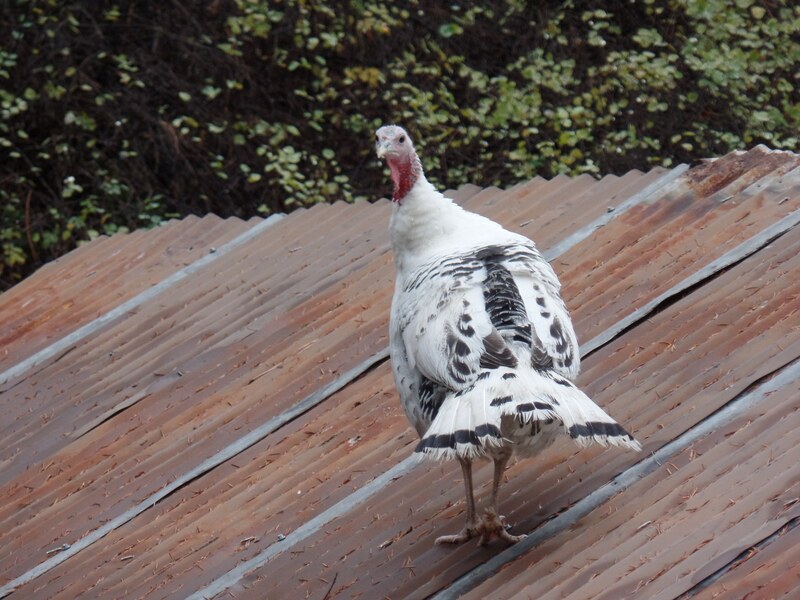 We hatched out our own turkeys this spring but only have four birds that survived to adulthood. 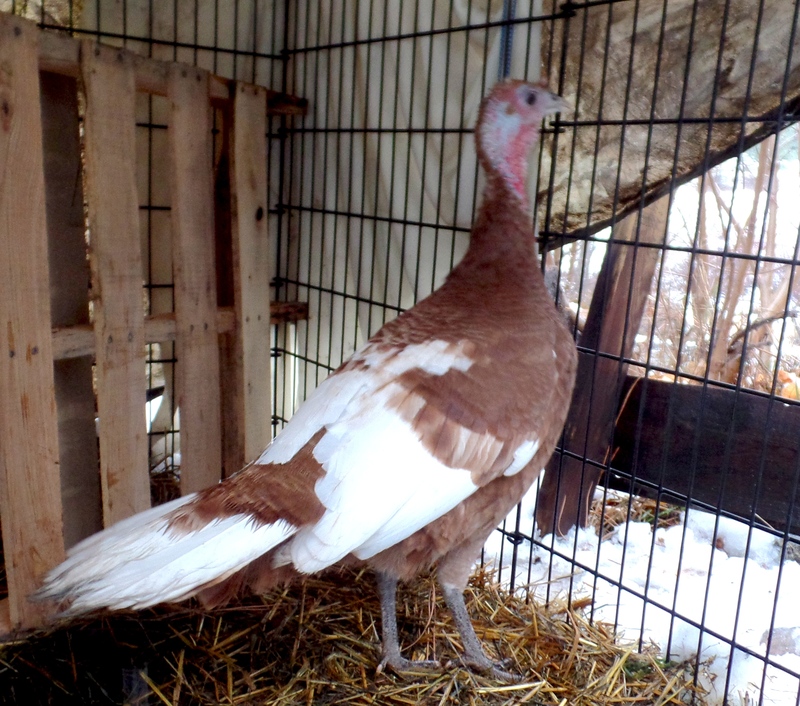 We got Royal Palm turkeys, a heritage breed that will be able to reproduce themselves. We believe our four birds are all hens and so we decided to keep them for breeding next year. This left us without a turkey for Thanksgiving. I was able to get one, however, from my neighbor who raises Bourbon Reds. I just have to butcher it myself. Our last bit of news is about the bees. I haven’t wanted to talk about them because we haven’t been very successful beekeepers. I didn’t do enough reading about them and decided to get bees a little late and missed the classes held by our bee club. As a result, we did not prevent or manage the swarming season very well. 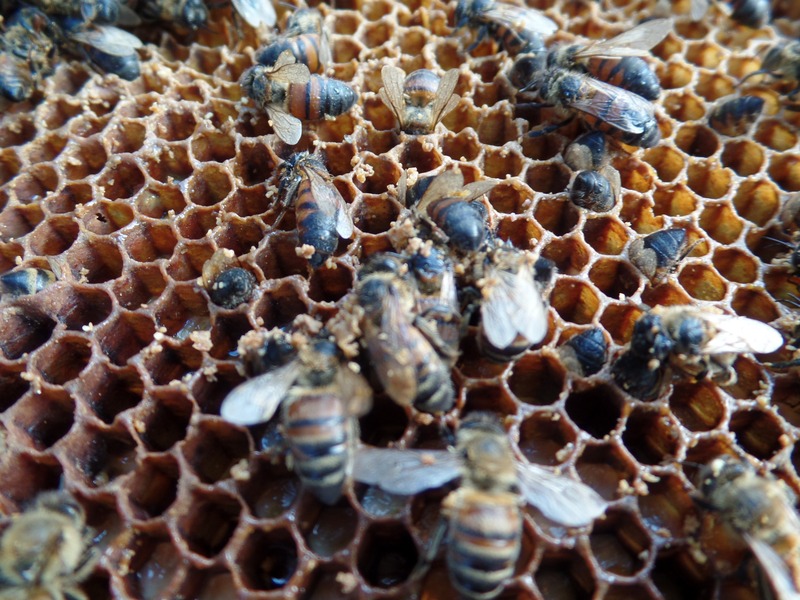 The two queens that came with our nucs each swarmed and left with half our bees. There may have been additional swarms after that as well. I did do an inspection on June 30 which was just at the end of our swarm season. I saw that each hive had raised a new queen but it was depressing to see so little bees in there. I didn’t check on them again until August 9th. One hive was definitely stronger than the other but neither looked very successful. It was warm enough this past week for me to check on the bees again. The weaker hive had died. I think there weren’t enough bees for them to keep warm during the cold snap we just had. The other hive was ok and I gave them as many frames of capped honey that I could. 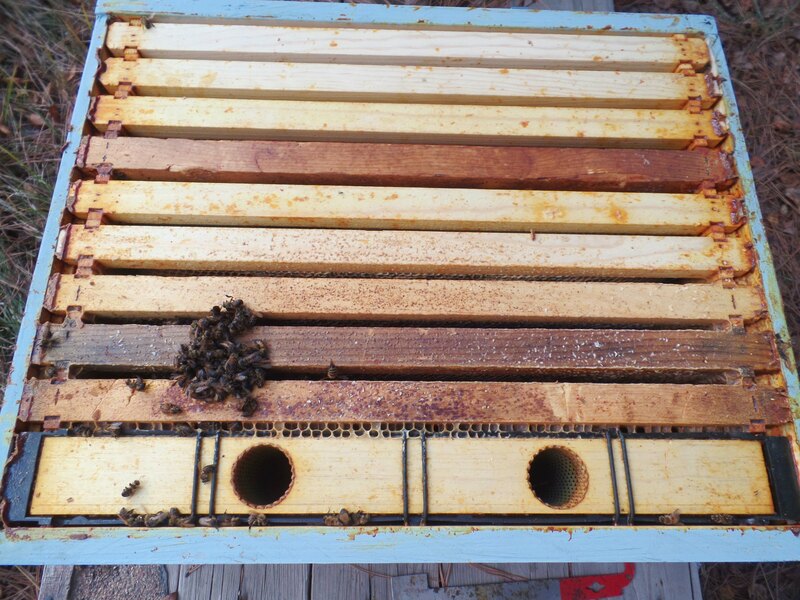 I interspersed the frames full of honey with the frames of bees and left them with both deep hive boxes for the winter. I was worried it would be harder for them to stay warm with two deeps but then I decided the more honey, the better. This entry was posted in Bees, Growing, Happenings, Other Barnyard Birds. Bookmark the permalink.